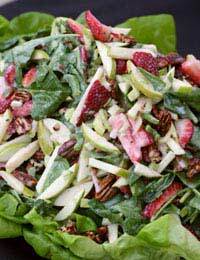 Ham and spinach salad can be lifted from the ordinary by adding various ingredients to it. Mustard powder and cheese are ideal for this. First take a bowl and place the mustard powder and water together before whisking. Next set the bowl aside and cut the cheese into small cubes. Once this has been done take the cheese, tomatoes, ham,spinach and cucumber and place in a large bowl. Next take the honey, oils and vinegars and place in the first bowl, containing the mustard and whisk together. Then pour this over the salad and toss, ensuring that the salad is well coated. The salad is now ready to serve. To make a spinach and ham salad even more adventurous, it is possible to add bread, garlic, asparagus and shallots. These can be added to make a warm salad. First take the bread cubes and toss in 1 tablespoon of olive oil,ensuring that the bread cubes are well coated. Next place on a baking tray and bake for approximately 5 minutes in an oven at gas mark 6(200C).By this time the bread cubes should be crisp. Next take the asparagus and cook in the remaining olive oil, over a medium heat. This should take approximately 5 minutes. During this time it is important that the asparagus is not stirred. Next gently turn the asparagus over and, after adding shallots and garlic, cook for an additional 3 minutes. Once this has been completed place the ham in with the asparagus, shallots and garlic before cooking for approximately 3 minutes. During this time it is important to constantly stir the ingredients. Next, using a slotted spoon, remove the ham, asparagus and shallots from the pan and place them in a bowl. It is important to keep them warm. Once this has been done take the balsamic vinegar, honey and lemon juice and place in the pan. Ensure that these are stirred well so that they mix with the cooking juices. The spinach then needs to be added and this should be cooked for approximately 3 minutes and seasoned with salt and pepper. The salad is now ready to serve.